LIVRE XV. DE LA MESURE DES TEMPÉRATURES. CHAPITRE PREMIER. PROCÉDÉS THERMO-ÉLECTRIQUES POUR ÉTUDIER LE DÉGAGEMENT DE LA CHALEUR DANS LE FROTTEMENT DES CORPS. CHAPITRE II. DE LA MESURE DE LA TEMPÉRATURE DES LACS ET DE LA MER A DIVERSES PROFONDEURS. CHAPITRE III. DE LA DÉTERMINATION DE LA TEMPÉRATURE DES TISSUS ET DES LIQUIDES ANIMAUX. CHAPITRE IV. DE LA MESURE DE LA CHALEUR DANS LES VÉGÉTAUX. CHAPITRE II. 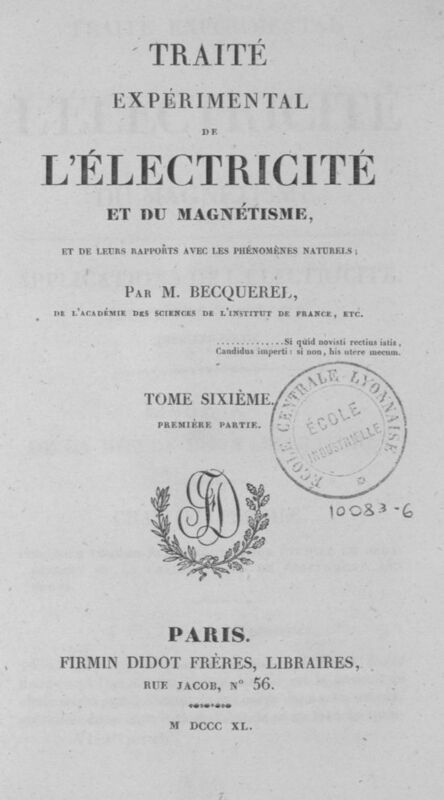 DE L'EMPLOI DES EFFETS ÉLECTRO-CHIMIQUES POUR ÉTUDIER LES CHANGEMENTS OPÉRÉS DANS LES CORPS SOUS L'INFLUENCE DE LA LUMIàˆRE. CHAPITRE III. DES VARIATIONS DU POUVOIR D'UNE BATTERIE VOLTAàQUE FAIBLEMENT CHARGÉE, EN RAISON DES CHANGEMENTS DE TEMPÉRATURE DE L'ATMOSPHàˆRE. CHAPITRE IV. DE LA FORMATION DE QUELQUES COMPOSÉS A L'AIDE DE PILES D'UNE CONSTRUCTION PARTICULIàˆRE. CHAPITRE V. MÉTAUX OBTENUS CRISTALLISÉS A L'AIDE DE FAIBLES COURANTS ÉLECTRIQUES FONCTIONNANT PENDANT LONGTEMPS. CHAPITRE VI. DESCRIPTION ET USAGE DE LA MACHINE ÉLECTRO-MACNÉTIQUE DE M. CLARKE. CHAPITRE VII. MACHINE ÉLECTRO-MAGNÉTIQUE ROTATIVE. CHAPITRE VIII. DIVERSES APPLICATIONS ÉLECTRO-CHIMIQUES. LIVRE XVII. DE L'ÉLECTRICITÉ ATMOSPHÉRIQUE. CHAPITRE PREMIER. DES PHÉNOMàˆNES GÉNÉRAUX DE LA FOUDRE. CHAPITRE III. de L'ÉLECTRICITÉ NÉGATIVE DE L'EAU DES CASCADES. CHAPITRE IV. DES TROMBES EN GÉNÉRAL ET DE LEURS RAPPORTS AVEC LA FOUDRE. CHAPITRE V. DES AURORES BORÉALES. LIVRE XVIII. DE L'ÉLECTRICITÉ ANIMALE ET DE L'ACTION DE L'ÉLECTRICITÉ SUR LES CORPS ORGANISÉS. CHAPITRE PREMIER. DU COURANT PROPRE DE LA GRENOUILLE. CHAPITRE II. NOUVELLES RECHERCHES SUR LES PHÉNOMàˆNES DE LA TORPILLE. CHAPITRE III. INFLUENCE DE L'ÉLECTRICITÉ SUR LE MOUVEMENT DE CERTAINES PARTIES DES CORPS ORGANISÉS. LIVRE XIX. DE LA PHOSPHORESCENCE. CHAPITRE PREMIER. PHOSPHORESCENCE PRODUITE PAR LES MOYENS MÉCANIQUES. CHAPITRE II. DE LA PHOSPHORESCENCE PAR LA CHALEUR. CHAPITRE III. DE LA PHOSPHORESCENCE PRODUITE DANS LA CRISTALLISATION. CHAPITRE IV. DE LA PHOSPHORESCENCE PRODUITE PAR LA LUMIERE ÉLECTRIQUE. CHAPITRE V. DE LA NATURE DES RADIATIONS QUI EXCITENT LA PHOSPHORESCENCE ET QUI DÉTERMINENT QUELQUES ACTIONS CHIMIQUES. CHAPITRE VI. DE LA PHOSPHORESCENCE DANS LES SUBSTANCES ORGANISÉES OU LES CORPS VIVANTS. CHAPITRE VII. DES TÉLÉGRAPHES ÉLECTRIQUES. CHAPITRE VIII. DESCRIPTION DU PROCÉDÉ ÉLECTRO-CHIMIQUE POUR APPLIQUER LA DORURE SUR L'ARGENT ET LE LAITON.